Disclosure: Some of the links in this post are affiliate links and I will receive a commission if you click on one of those links. Resolutions, smesolutions. Okay, not really. But if you're like most, you've already given up on your year-long goal. I genuinely hope that's not the case and if you're still on the right track, good for you! I know it's not creative, but I fall into the camp of individuals who started a diet on January 1. I joined Weight Watchers and since the first I'm down nine pounds! I choose WW because it's a program I've done before and I like how it emphasizes diet and exercise - no magic pill, gargling oil or eating only bacon (okay, that diet doesn't sound so bad). The point tracking really works for me and it's just the accountability I need to stick to it and lose the pounds. But now that I'm taking my dieting seriously I needed to give my kitchen a once over and make sure I've got all the tools to be successful with this year's resolution. After a quick evaluation, I put together a list of kitchen items that can help me, and you, stick to our diet this year. If you follow me on Instagram you know I'm OB-SESSED with Skinnytaste, the cookbook , and the website. The recipes are loaded with flavor and they're healthy. I've personally made over 100 of her recipes and have loved almost every single one of them. Now there's a Skinnytaste Meal Planner! Organizing your meals each week is one of the best ways to stick to your diet, it helps you create a grocery list which is one of the best defenses from buying unnecessary sweet treats. Another great side effect of meal planning is that it also helps you stick to a budget. More so than ever before, I'm now concerned with the exact measurements of the foods I eat, the sugar I add to my coffee and the peanut butter I spread on my apple. I use measuring spoons more than any other utensil or tool in my kitchen. I have three sets and I have to wash all, or almost all of them every day because I use them so much. Same goes with measuring cups, I use them all the time and they are even more important than ever now that I'm dieting. Meal prep, cooking dinners and measuring just how much popcorn I can eat because the whole bag isn't really an option - measuring cups are a must-have if you want to cut the pounds in 2016. Most people already have measuring cups and spoons but they often overlook a kitchen scale. Do you really know what 3 ounces of turkey looks like or how big a 6 ounce chicken breast is, because I didn't. In fact, most of the chicken breasts are at least half the size of what they sell at my supermarket. Okay, bear with me on this one because I realize that this is an investment but it is absolutely worth the money! A Vitamix will change your life - it will help you make nutritious smoothies, yummy soups, and even ice cream. I love adding peaches and strawberries with ice and pureeing them until they are like ice cream - yum and way better for you than the stuff from the store. Plus if you are a mama this lovely contraption is perfect for making baby food. If you make the investment, a Vitamix comes with a cookbook and there's also an awesome online community of Vitamix fans who share their recipes and experiences. Sometimes you need to invest in your goals and if you're serious about getting and staying healthy, this is one of the things you need in your kitchen. When you go on a diet you tend to shy away from the processed foods which means you are probably cooking more and planning out those lunches for work, so you are going to need some great food storage options that will go from fridge to freezer to lunch box. The first thing that comes to mind when I think diet is food but really one of the best improvements we can make is to increase our water consumption each day. It helps your skin, your health, and your overall mood by helping you flush out nasty toxins stuck in your body. Having a water bottle on hand will help remind you that you need to drink more H2O throughout the day. Having the right tools in your kitchen will help you get one step closer to your ultimate weight loss goal - it's almost as important as having the fruits and veggies. 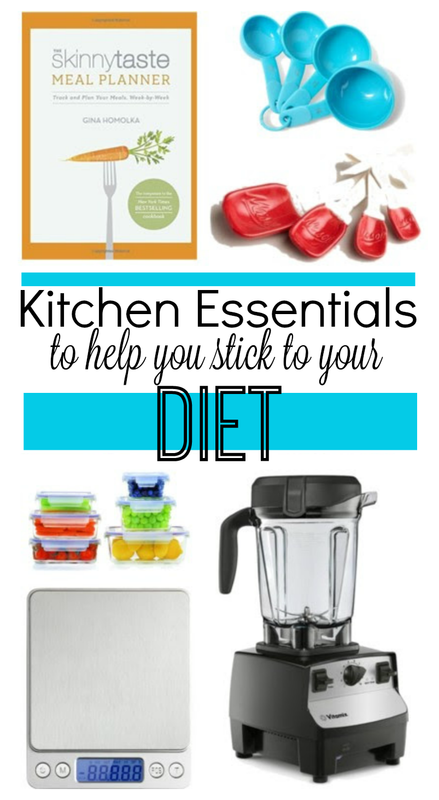 What kitchen essentials do you rely on to keep you on track?